The inaugural Warrior Bazaar show, held on Sunday at the Holiday Inn, Bolton. Martin and I cadged a lift off Graeme, listening to a CD of an adaption of 'Shadows over Innsmouth' on the way down. Located near the centre of Bolton we did a few laps of the road system before finding a car park. Apparently the place had an underground one available but we couldn't find it but found a free car park next to the spot anyway. Venue is a nice place, the convention\wedding reception area being a converted church. 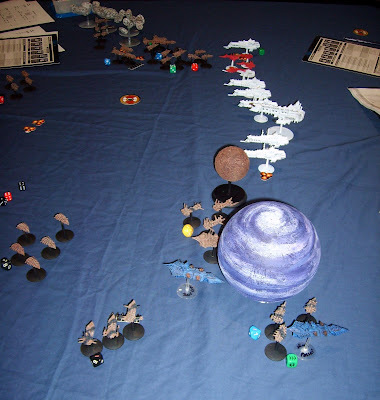 The event itself was split between a number of rooms on the ground floor and in two separate sections with traders scattered across rooms with an unfortunate few being stuck in secluded locations. Not exactly over-crowded with customers but the usual ignorant backpack swingers tried to make up for it. The ailes were actually quite narrow so not sure what it would of been like if it had been busy. The Helms Deep demo was impressive (even if it was advertised in the program as Doctor Who; I didn't see the Tardis there so I'm guessing the game was a replacement!). Also the Colonial game in the side room looked good, but other than that the other demos were pretty scarce and low key. The Sci-Fi and ACW re-enactors seem to enjoy themselves, with a couple of stormtroopers guarding the entrance and a couple of musket wavers as backup. So in total we spent a couple of hours there, and ended up agreeing that it was an enjoyable little show and a useful addition to the calendar this side of the Peninnes. Whether the show gains enough traction to be repeated next year is another matter. A couple of bigger names amongst the traders could help; No Kallistra, Essex, or even Lancashire Games! And very few boardgame sellers other than second-hand stalls. Also in the program was an advert for 'Warboot by-the-sea' being held in Morecambe in July, Warboots being old fashioned bring-and-buys dedicated to gamers, especially useful now that eBay has jumped the shark in term of fees; and that convention based bring and buys are getting an increasingly bad reputation. The Battle of Flodden: The 'Professionally trained' Scottish army. 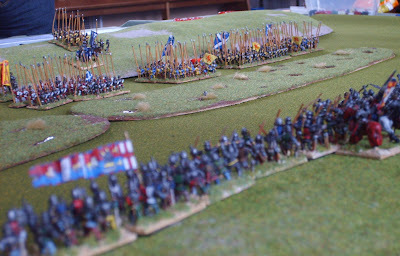 lead by James IV vs the English reserves\Northern louts lead by the Earl of Surrey. 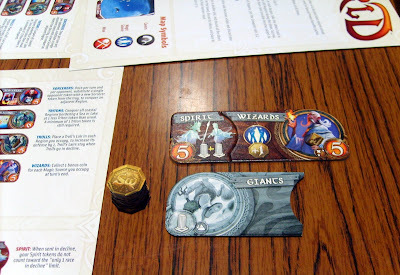 Played with Warhammer Ancients at 15mm, with a number of special rules to simulate the conditions. Organised by Matt (who now never wants to paint a 15mm pikeman again in his entire life.). The battle started in fine style with an artillery duel, the Scots firing first with little effect but the English return of fire taking out a couple of guns, and the bounce hitting the troops behind. Likewise in the next round the English took out two more guns, but these were their own! destroyed by misfires. The English got the better of the exchanges, leaving only two Scots guns overlooking the English left. 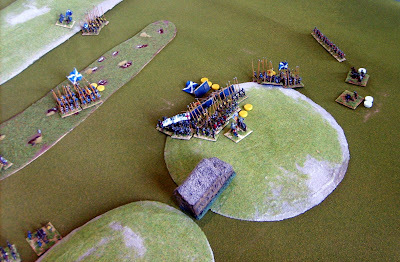 The Scots left made good speed though the mud and managed to get through it and organised back into a phalanx before the English could engage. The Scots elsewhere weren't so lucky and melees in the mud began and a long battle of attrition began. 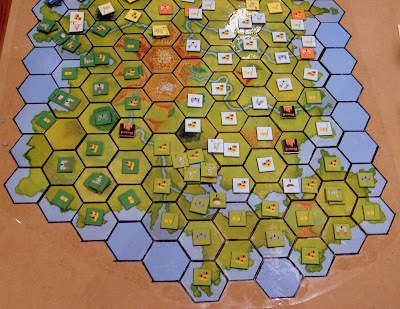 Things started to look very bad for the English as the right started to break and run, but a rally on the hill, as well as throwing the archers into melee, helped stem the flood. The left was now under English control, with Stanley's arrival silencing the last of the Scottish cannons and a combined attack from Stanley and Darce's Cavalry taking out the Highlanders, who had previously been shifted out of the marsh. The right just about held, with the English archers doing well in hand to hand. With the flank turned the Scots decided to withdraw (and the French contingent, who never saw battle, agreed.) So after a bad start the English managed to pull it out of the bag at the very end. 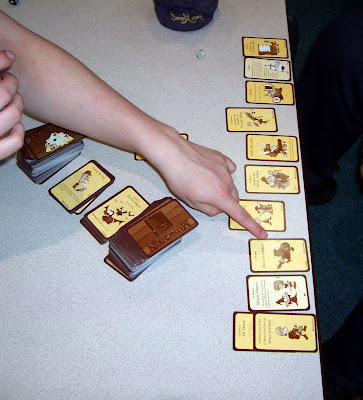 Campoon delayed again; So time to dig out my copy of Munchkin, by Steve Jackson Games, with a couple of the expansions chucked in. Martin, Dave S and Me. Martin quickly built a lead and despite Dave and Mine best efforts there was nothing we could do to hold him back, in fact my character took a long time to get off 1st level. 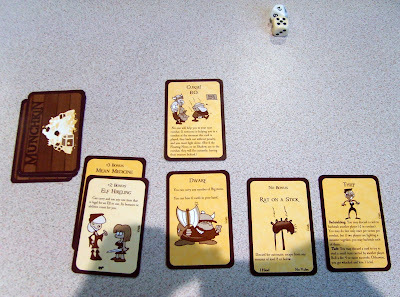 Martin's character certainly earned the Munchkin title. Dave S, Colin, Baldy and Me. Colin's first game and more balanced as a four player. And as seems traditional with this game he was also the winner, hitting level 10 just before Dave S and me, both of us ending on level 9. Baldy trailed in last at level 1 after making the mistake of single-handedly trying to screw all three of us over at the same time. A busy night at the club. 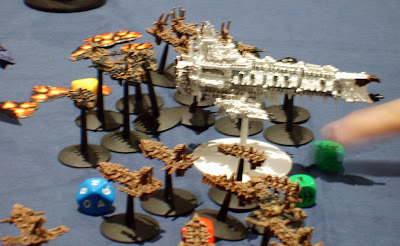 Phil and Jock played Battlefleet Gothic. 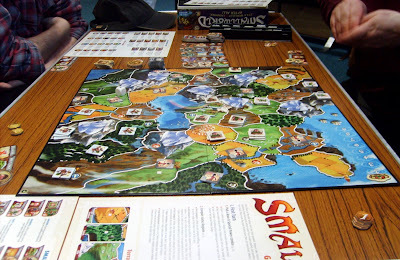 Another 5 player game of Smallworld, and 3 tables worth of Role-players, including one of Star Frontiers which I've not seen in years. Possible the oldest (fully realised) computerised adventure world in this world is back! Legends of Zork is now online as part of the Jolt network. It's free to play but with buyable bonuses. 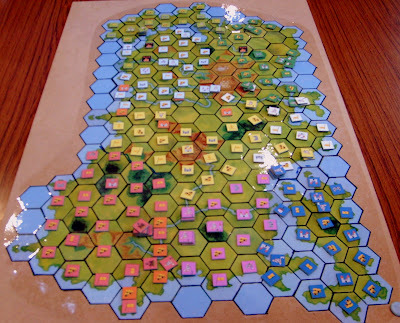 Given the recent demise of Dave Arneson, who gave us the oldest role-playing world in Blackmoor. (see OotS for a good tribute) it's sort of appropriate that the world of Zork (a.k.a. The Great Underground Empire) is back, but admittedly in a form totally different from before. Zork was always more mind over matter in its text-based game play (the more warped the mind the better). Myst sort of nicked the baton of the Zork series with its visual, cryptic, problems; which Zork tried to follow, but both sort of ran out of steam and their many sequels failed to capture the uniqueness of the originals. Legends of Zork is totally Web based and massively multi-player; and first impressions is that of a simple bash along, with XPs, levels, equipment lists, and a lot of conventional RPG trappings (plus the promise of guilds etc in the future, the game is very much still in development). 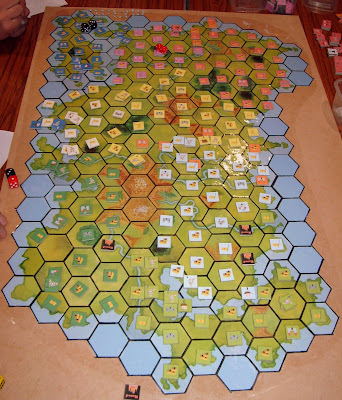 So where has the traditionally emphasise on problem solving, the mainstay of many a text adventure, got to? Maybe it's subtly hidden within in the new game with the Fanucci cards that you randomly pick up and in the design of the related gambit. Working out how these cards relate to each other can increase you chance of success in a given combat dramatically. Of course this means that once people work out the card play (and the solutions inevitable distribution on the net) will there be a game left to play? 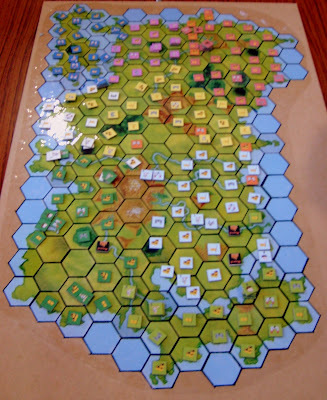 Given that the game isn't too deep I think so, it sounds counter-intuitive but I've found that the simpler the game the more incentive to role-play and get communities together, especially in games that can't be 'won' - possibly the true definition of an RPG campaign world. Popped my head in on Saturday to see how the 40K guys were doing in the now regular tournament\grudge match with the Manchester Area Wargames Society (MAWS) the Barrow leg of which is organised by Phil. Managed to catch the final round of the three round tournament. Martin was the scorer tapping away into the spreadsheet as each result came in. The FW trailing right from the first round and failing to noticeably close the gap in the second and third. It ended as a clean sweep for MAWS with the top 4 individual spots going to them. The only silverware for the FW was Keiron managing to win the fair play award, presumably because his forces died well. In another shock result Baldy didn't finish last! Found the video creation mode in Picassa so decided to have a play around. Quality not as good as normal pictures, I could improve it but would eat up Picassa directory space. Returned to the Campoon to find that Jim had reversed his decision to quit and is back in the land grab. My territory survived intact but a barbarian incursion during winter knocked my income back. Also I've now got an unwanted fort after Mark (who I gave pre-written instruction to) misinterpreted the location of the peninsula's 'choke point'. Dave S is now an underling of Matt (Grima to Matt's Saruman or, probably more appropriately, Smee to Cpt. Hook), and combined together they split the continent of Nu Campoon in two. After this turn a couple of battles took place. One between the Nurgles and Paul after the Nurgles got sick of running away. The second between my Triangles and Dave M's Sassinids, as I put three armies against his one. The Wall of Ceorls, trimmed with a line of Huscarls and Thegns. When Mark mentioned that we were a slow moving wall we pointed out that walls don't generally move at all. 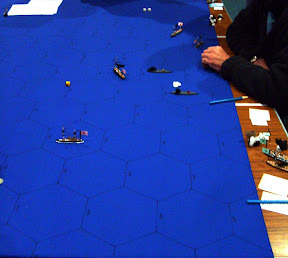 The Triangles slowly push them off the board as not a single meelee took place, only some consistant sniping. 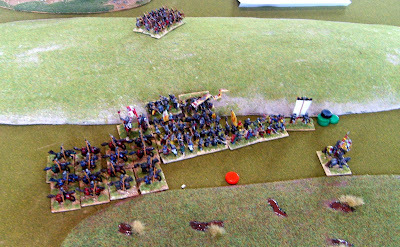 The hit and run tactics did knock down the Triangle forces a bit but the solid wall restricted the cavalry and with no more room to maneuver they left the field but only after mulling a trial charge of one of the numerous Shieldwalls. Due to absentees next week (including myself) the campaign will be given a miss.